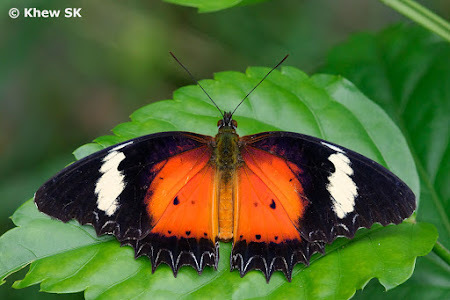 Butterflies of the genus Cethosia are medium-sized, colourful with attractive geometric patterns on their wings and are amongst some of the prettiest butterflies of the region. 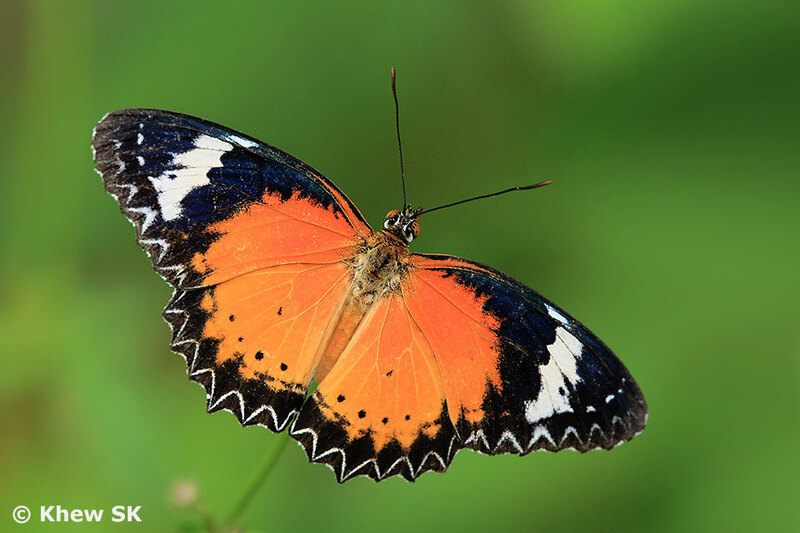 Collectively referred to as "Lacewings", the Cethosia species feature aposematic colouration - which is the butterfly's display of warning colours to deter would-be predators from eating them. 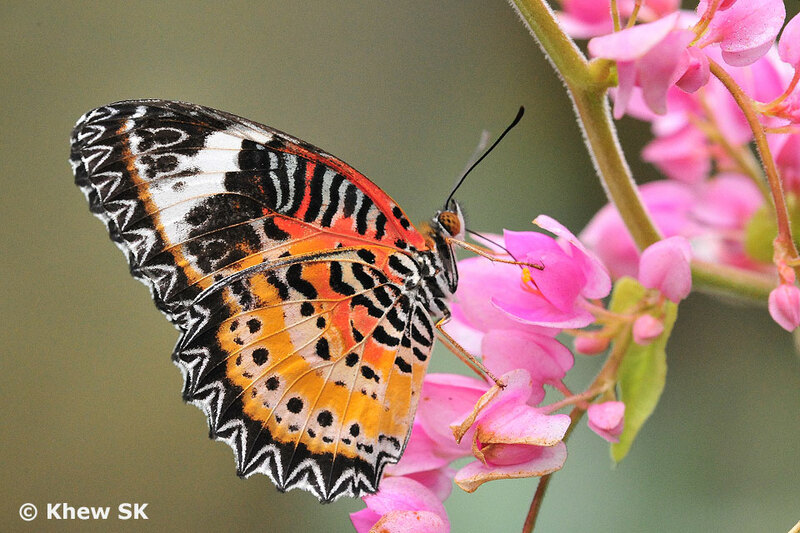 Whenever a butterfly watcher encounters a Lacewing species, it is hard not to stop and admire them as they flutter unhurriedly from flower to flower, or just flying slowly on their way to their next destination. 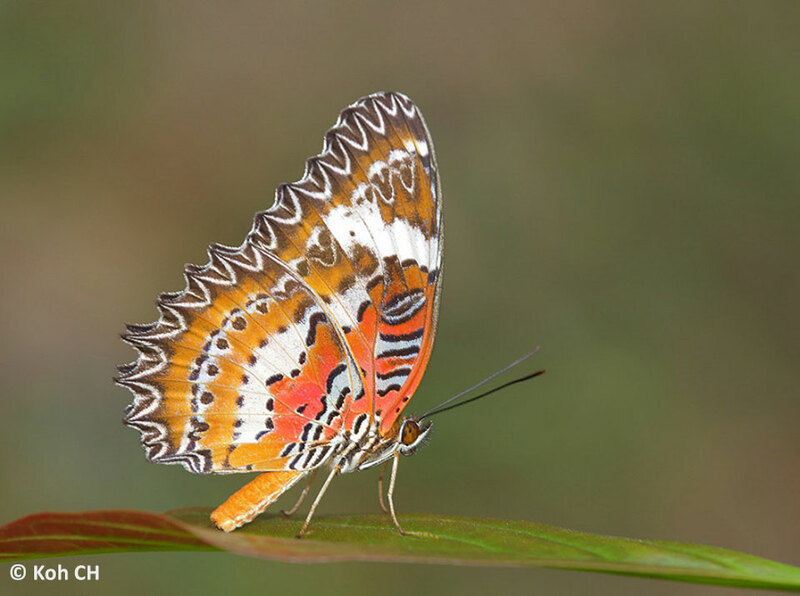 Three species of the genus Cethosia are found in Singapore. 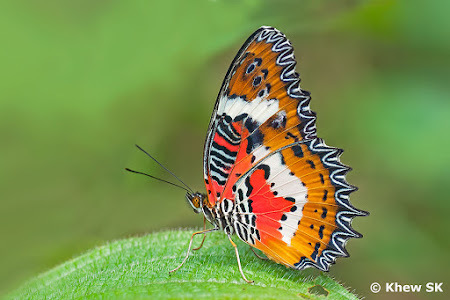 One species, the Leopard Lacewing (Cethosia cyane) is a recent addition, only having been seen in Singapore in 2005. This species probably migrated naturally from the north over the years and finally settled in Singapore. Today, it is the commonest species of the three Cethosia in Singapore, as it is regularly observed in forest habitats as well as urban parks and gardens. The other two native species extant in Singapore are predominantly forest-dependent, and are to be usually found in the forested nature reserves. Of these two, the Malay Lacewing (Cethosia hypsea hypsina) is the commoner of the two, and is regularly seen in our nature reserves where its caterpillar host plant, Adenia macrophylla can be found. The last species, the Plain Lacewing (Cethosia methypsea methypsea) is rare and makes intermittent appearances over the years, sometimes not seen for a long time, and then re-appearing and frequently observed for some months, before disappearing again. 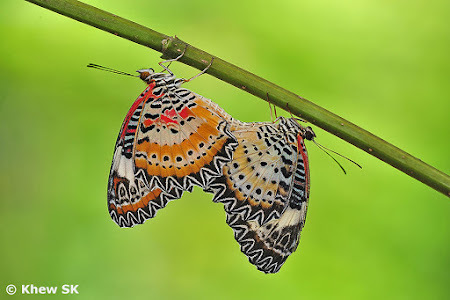 The upperside of the wings of both the male and female of the Malay Lacewing features a bright orange-red colour with contrasting black borders.outer margins of both wings are serrated, particularly more so on the hindwings, giving the wings a saw-toothed appearance. The underside of the wings display intricate patterns with attractive orange, red, black and white colours. 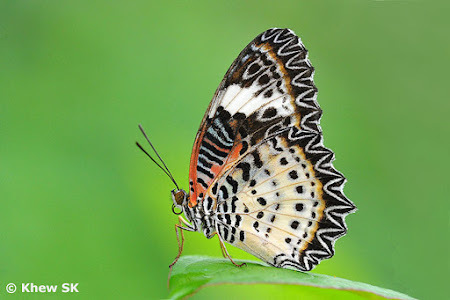 The female Malay Lacewing has a creamy white patch on the dorsal margin of the forewings above, whilst the more orange-red male does not have this patch. The female also appears a lighter orange in colour compared to the male's orange-red wings. 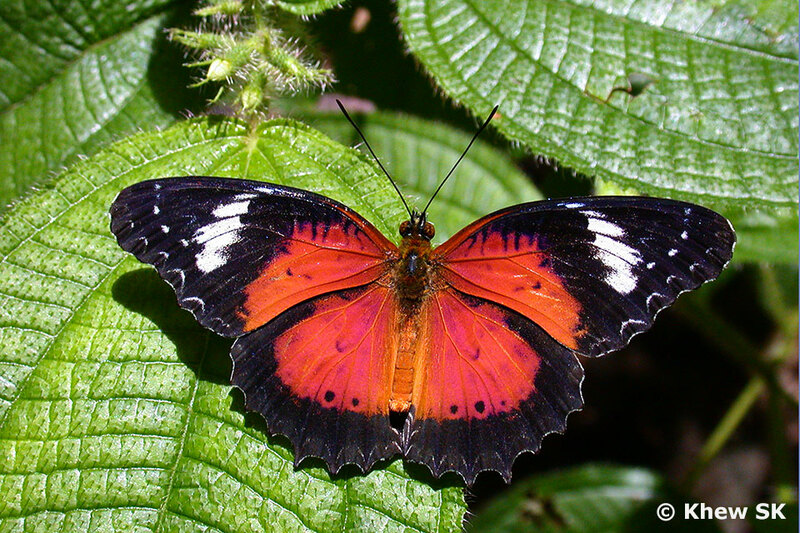 On the underside, the male has a reddish sub-basal patch on the hindwing whilst the female's wings are orange. 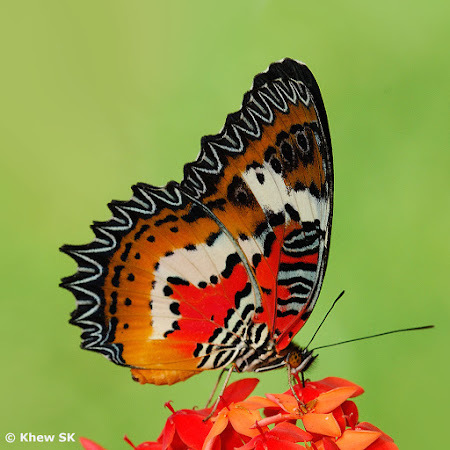 The butterfly is mainly found in the forested areas, preferring to remain within the sanctuary of the nature reserves in Singapore, rarely venturing out to the urban parks and gardens. 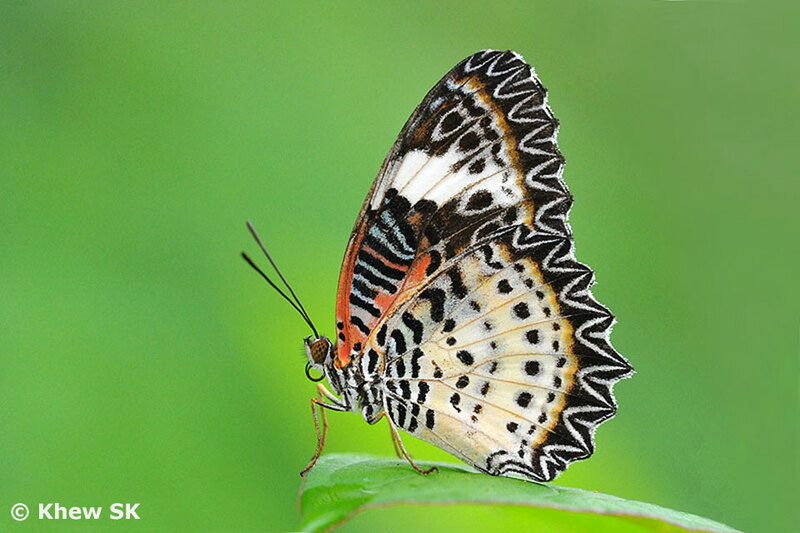 The Malay Lacewing can also be found on our offshore island of Pulau Ubin, particularly on the forested western part of the island. 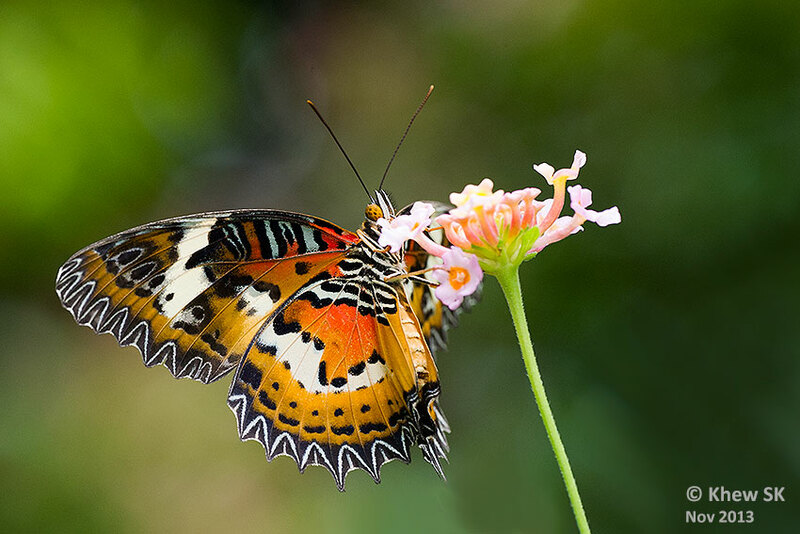 It is regularly photographed feeding at flowering plants like Lantana, Ixora, Syzygium and the Mile-a-Minute weed. This species is intermittently found in Singapore. It can be considered very rare, and found only in the forested nature reserves, where its caterpillar host plant, Adenia cordifolia grows as a climbing vine. After making an appearance for a few years in the late 1990's in Singapore, it disappeared and was not seen at all. A period of almost 14 years passed before it re-appeared again, some time in Sep 2014. For a few weeks thereafter, the species was regularly spotted in the same vicinity. The Plain Lacewing can be distinguished from the Malay Lacewing by the thin white sub-marginal line on the underside of the hindwing, which the Malay Lacewing lacks. 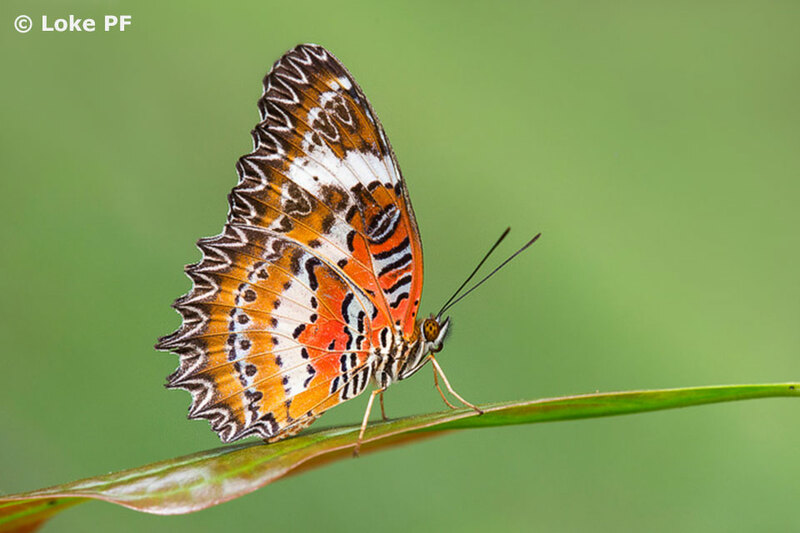 On the upperside, the apical area of the forewing is also markedly different in the sub-apical band that is sufficiently distinctive enough to separate the Plain Lacewing from the other two species found in Singapore. 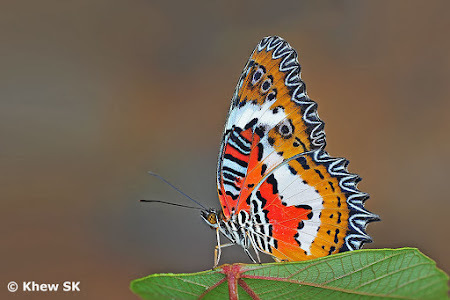 The upperside of the Plain Lacewing generally appears more reddish than the Malay and Leopard Lacewings, and when it flight, the Plain Lacewing is usually faster and more skittish. Unlike its two cousins, the two sexes of the Plain Lacewing are very similar without very distinctive features to separate them. 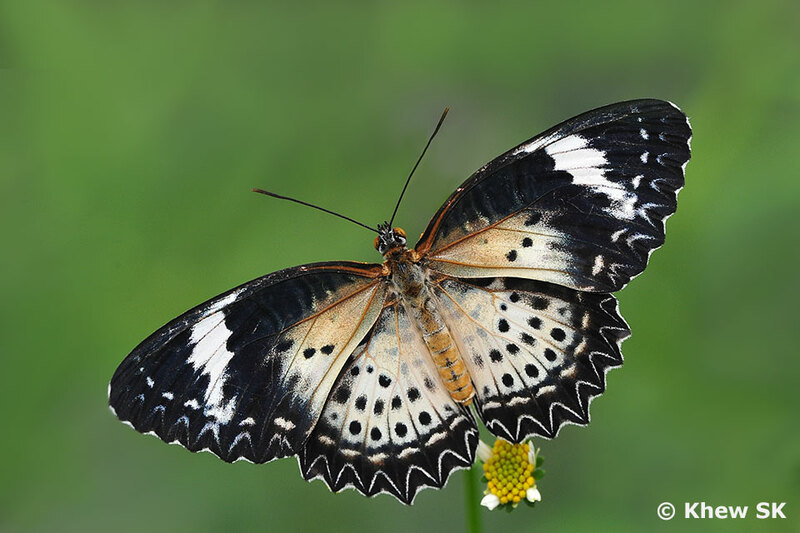 The last of the three representatives of the genus is Singapore is a recent addition. After it was first spotted in the western catchment in Singapore in the year 2005, the Leopard Lacewing spread across the island very rapidly. 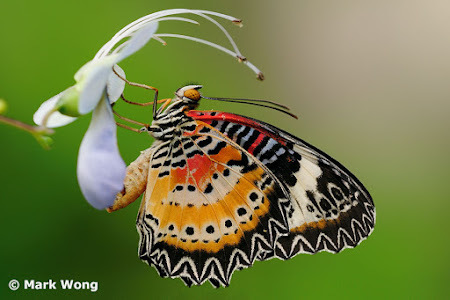 The abundance of its caterpillar host plants, Passiflora foetida and Passiflora suberosa, both of which are considered urban creeper-weeds, is probably one of the reason why this immigrant has colonised and stayed on for the long term in Singapore. The Leopard Lacewing is by far the commonest species of the three Cethosia in Singapore today. 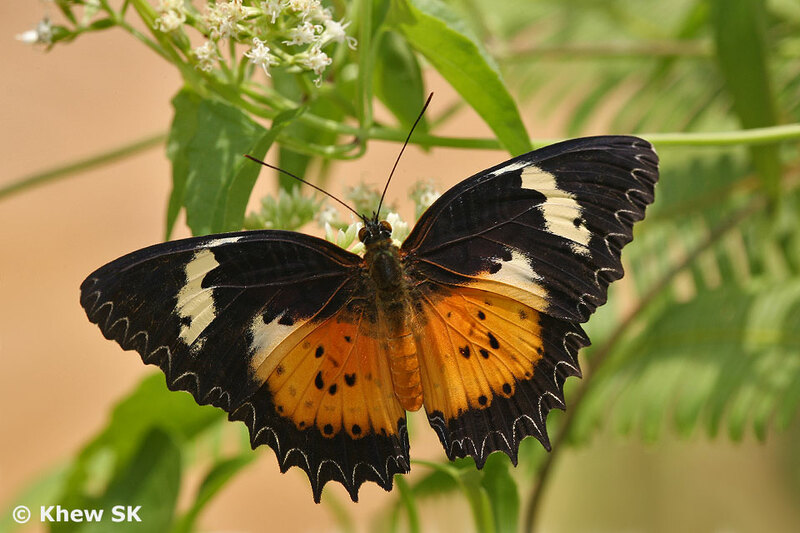 It can be found foraging in urban parks and gardens, feeding on flowering plants in community butterfly gardens, in the company of other urban butterfly species. It is seasonally common and often several individuals may be seen in the same vicinity regularly. 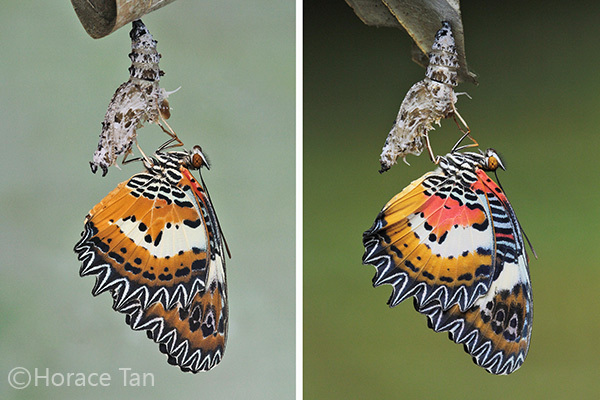 The male is orange above, with black borders, similar to the Malay and Plain Lacewings. It appears more orange on the upperside. The female is a creamy yellow above and is distinctively different from the male. On the underside, the large series of post-discal spots, set in a rather broad white sub-marginal band, sets it apart from its other two cousins in the genus. To the north, in Malaysia and Thailand, a fourth Cethosia species can be found. 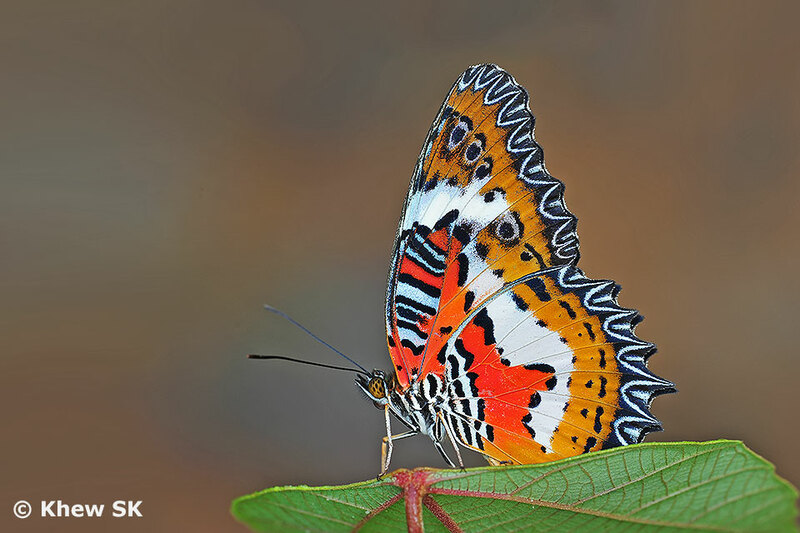 This species is called the Red Lacewing, or sometimes referred to as the Batik Lacewing - Cethosia biblis. 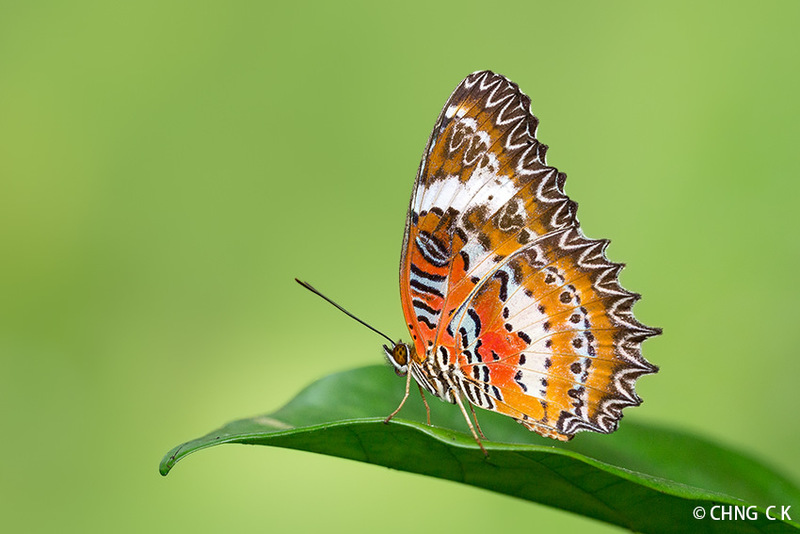 This species has rather distinctive sub-apical markings on both the upper- and underside of the forewings and easily distinguished from its cousins. The Red Lacewing has not been recorded from Singapore yet, and hopefully, it can be a new addition to the Singapore butterfly fauna in the future.